Today is the International Day of Peace. First declared in 1981, the United Nations resolved to observe this day, September 21, every year for the purpose of fostering peace throughout the world. I took my children to the state capitol this evening to participate in an event honoring the day, which included music, dancing, & speeches among other things. It was hot, the baby was tired, and my youngest boys were more interested in digging for worms & eating the complimentary snacks, than focusing on the event itself. This year’s gathering was focused on the youth, which is wonderful , as I think it’s crucial to empower the up-and-coming generation if we truly want to foster any kind of real change in the world. I was hoping the younger nature of the crowd would draw my children’s interest, but after a long day at school, the last thing they wanted to do was listen to dialogue about international relations. I knew it was time to go when my teen starting throwing raisins at the baby, who was busy trying to stuff wood chips in her mouth. As I rounded up the other two (who had now moved on to a game of “kick the stale loaf of bread around the capitol lawn”), I felt pessimism overshadowing my otherwise sunny mood. 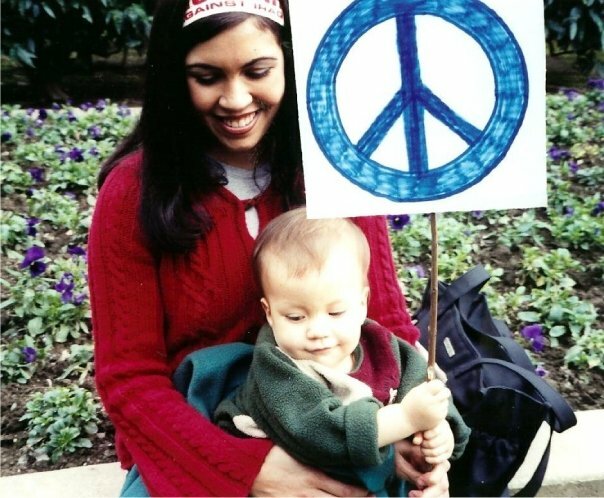 What is peace anyway? In this age of social-networking, Skype, & text, I marvel at how disconnected we are. How often have you walked into a room and seen a group of people together, each separately engrossed in their own electronic communication devices. Be it texting, typing, or swiping…it seems like we are all so busy staying connected, we forget to acknowledge the here & now. Can peace be fostered in an age where people are more comfortable hiding behind screens, than reaching out to one another in real-life? There’s a saying that goes, “You cannot shake hands with a clenched fist.” Good point. Nor can your extend your hand if it’s grasping an iPad. I know technology is not going away, so I worry quite a bit about how I can encourage my children to make meaningful connections in this wireless age. Several years ago, on my way to my youngest son’s daycare, I came upon a large group of visibly agitated high school students who were loitering in the parking lot near the campus. The street was busy, as there were parents parked all along the road waiting to pick up their teens—and students on foot were homeward bound. As I waited for the light to turn green, the swarm of loitering teenagers parted for a moment to reveal two boys in the center of the group, tossing their backpacks to the ground and exchanging heated threats. I watched helplessly and the bigger of the two took a swing at the other, knocking the smaller boy off-balance, long enough for two others to leap in and began fighting as well. The kid was getting jumped. I anxiously glanced around, hoping someone would step in, but everyone just stared, some even looked away-perhaps too uncomfortable to watch what was clearly an unfair fight. Two thoughts raced through my head; 1) That boy is somebody’s son, and 2) If it were my son getting jumped, I would want someone to intervene. Ambrose Redmoon once said, “Courage is not the absence of fear, but rather the judgement that something else is more important than fear.” I am not a confrontational person, nor do I like conflict. But If I see a situation in which a person’s rights, safety, or well-being is being violated, I will not hesitate to confront it in whatever way I can. When my boys are at each others throat, I always remind them that they are their brother’s keeper. As they transition from my home out into the larger world around them, I can only hope that they will remember to respect& honor their brothers and sisters throughout our community. Peace thrives when we remember that, differences aside, we belong to each other. Each & every one of us.